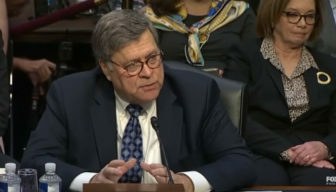 Attorney General-designate William Barr at his confirmation hearing. Washington – After meeting with the President Donald Trump’s candidate for U.S. attorney general Monday afternoon, Sen. Richard Blumenthal said he would not support William Barr. During Barr’s confirmation hearing before the Senate Judiciary Committee last month, Barr, a former U.S. attorney general in the George H.W. Bush administration, declined to commit to making public the final report by Special Counsel Robert Mueller on Russian interference in the 2016 election. Blumenthal, a member of the panel, had pressed Barr on the issue. “At the hearing, I had a number of concerns even after his responses to my questions and others’ about his nomination. I have differences with him on policies – for example, on women’s health care and reproductive rights, as well as criminal justice reform and civil rights,” Blumenthal said. If confirmed, Barr would assume oversight of Mueller’s far-reaching investigation, which is also probing possible coordination between Trump campaign associates and the Kremlin. Despite Blumenthal’s opposition, the Judiciary Committee, which has a Republican majority, is expected to advance Barr’s nomination when it holds a vote Tuesday on the candidate.